As the list of endangered animals grows longer each year, at least one species' situation is improving: The peregrine falcon. The bird of prey could be removed from Canada's list of endangered species — a list it's been on since 1978. ​You may have noticed some flying around in the greater Montreal area. In 1980, there was one peregrine falcon couple in southern Quebec. Today there are 196. In fact, the number of peregrine falcons born this past summer was a record with 25 — and even more rare is that they all survived. 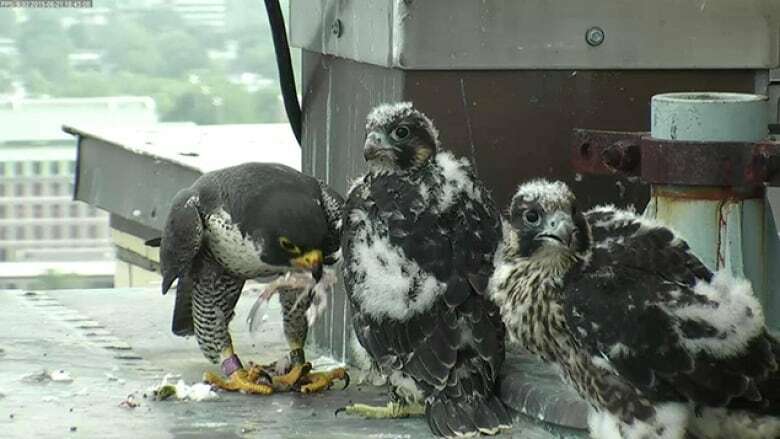 François Shaffer, a Canada Wildlife Service biologist responsible for endangered species, said he thinks at this point peregrine falcon populations across North America are faring better now than in at least the past half-century. "The United States took it off its endangered species list in 1999. They are also present in Canada's North. We don't know the size of the populations in the North in comparison to the southern areas, but the numbers are now relatively large," Shaffer said. These numbers don't take into account nests too difficult to access, namely those on l'Île-aux-Tourtes, Charles-de-Gaulle and Larocque bridges, as well as the top of the tower on the Olympic Stadium. 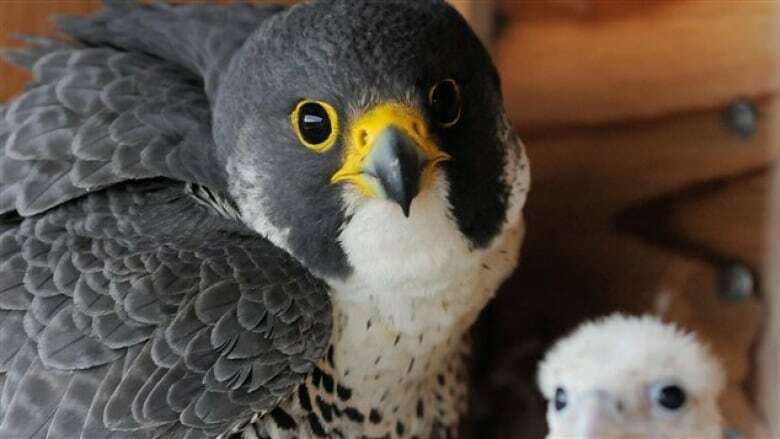 Antoine St-Louis, an endangered species biologist with Quebec's Environment Ministry, said the peregrine falcon's resurgence is unique given why populations declined so rapidly in the mid-20th century. The predatory birds died in rapid succession after the increase in the post-World War II usage of DDT, a harmful insecticide that has been illegal in Canada since 1972. But by that time, the damage had already been done. According to Parks Canada, the birds may be doing better now, but they are still "vulnerable to environmental toxins which accumulate in their food chain." And some conservation groups in the province say that knowing one single chemical product ravaged the peregrine population in the past should be a warning about other widely used chemical products in the future. The next time Quebec counts its falcons will be in 2016. Meanwhile, Canada re-evaluates its endangered and protected species list every 10 years, and so the final decision about whether to revoke the bird's endangered status should be taken in 2017.